Variation of the founding myth as shown in the post-Conquest Tovar Codex, where the eagle is devouring a bird. The coat of arms recalls the founding of Mexico City, then called Tenochtitlan. The legend of Tenochtitlan, as shown in the original Aztec codices, paintings, and post-Cortesian codices, does not include a snake. 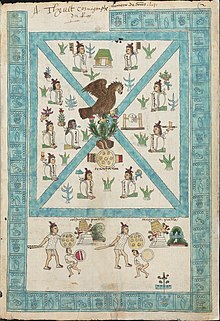 While the Codex Fejérváry-Mayer depicts an eagle attacking a snake, other Mexica illustrations, such as the Codex Mendoza, show only an eagle; in the text of the Ramírez Codex, however, Huitzilopochtli asked the Tenochtitlan people to look for an eagle devouring a snake, perched on a prickly pear cactus. In the text by Chimalpahin Cuauhtlehuanitzin, the eagle is devouring something, but it is not mentioned what it is. Other versions (such as the backside of the Teocalli of the Sacred War) show the eagle clutching the Aztec symbol of war, the atl-tlachinolli glyph, or "burning water". Moreover, the original meanings of the symbols were different in numerous ways. The eagle was a representation of the sun god Huitzilopochtli, who was very important, as the Mexicas referred to themselves as the "People of the Sun". The cactus (Opuntia ficus-indica), full of its fruits, called nōchtli in Nahuatl, represents the island of Tenochtitlan. To the Mexicas, the snake represented wisdom, and it had strong connotations with the god Quetzalcoatl. The story of the snake was derived from an incorrect translation of the Crónica Mexicáyotl by Fernando Alvarado Tezozómoc. In the story, the Nahuatl text ihuan cohuatl izomocayan "the snake hisses" was mistranslated as "the snake is torn". Based on this, Father Diego Durán reinterpreted the legend so that the eagle represents all that is good and right, while the snake represents evil and sin. Despite its inaccuracy, the new legend was adopted because it conformed with European heraldic tradition. To the Europeans, it would represent the struggle between good and evil. Although this interpretation does not conform to pre-Columbian traditions, it was an element that could be used by the first missionaries for the purposes of evangelism and the conversion of the native peoples. Depiction of founding myth from the post-Conquest Mendoza Codex. In 1960, the Mexican ornithologist Rafael Martín del Campo identified the eagle in the pre-Hispanic codex as the northern caracara or "quebrantahuesos" (bonebreaker), a species common in Mexico (although the name "eagle" is taxonomically incorrect, as the caracara is in the falcon family). The golden eagle is considered the official bird of Mexico. When Father Durán introduced the snake, it was originally an aquatic serpent. But in 1917, the serpent was changed to be a rattlesnake, because it was more common than the aquatic varieties in pre-Hispanic illustrations. As a result of this, the design and color of the snake on the modern coat of arms do not correspond with those of any species of snake, and were inspired by the representations of Quetzalcoatl, a rattlesnake with quetzal feathers. The emblem can be interpreted on at least two levels of abstraction. First, the pictographic/logographic depiction of the name of the Aztec's capital city, Tenochtitlan, as tenoch refers to the cactus fruit while -ti-tlan is a ligatured locative suffix meaning "below/among/at the base of." On another level, it represents one of the most important cosmological beliefs of the Aztec culture. The emblem shows an eagle devouring a serpent, which actually is in conflict with Mesoamerican belief. The eagle is a symbol of the sun and a representation of the victorious god Huitzilopochtli, in which form, according to legend, bowed to the arriving Aztecs. The snake is a symbol of the earth and, in certain pre-Hispanic traditions, a representation of Quetzalcoatl; more specifically, in Aztec (Mexica) tradition, the snake is the representation of Coatlicue, the personification of earth and mother of Huitzilopochtli. In some codices, the eagle holds the glyph for war to represent the victorious Huitzilopochtli. This glyph, the Atl tlachinolli, which means "water and flame", has a certain resemblance with a snake, and may plausibly be the origin of this confusion. With the element, the attributed element of the moon, it recalls the mythology of the god and hero of the Aztecs. The fruit of the nopal cactus, called tuna, represents the heart of Copil, the nephew of the god Huitzilopochtli. The god ordered the people to "build the city in the place of Copil's heart" (Ramírez Codex), where the cactus grew on his land. It also alludes to the human sacrifice customs of the Aztecs. The seal of New Mexico includes the eagle, snake, and cactus of the Mexican seal, sheltered or dominated by an larger bald eagle, representing New Mexico's history as part of Mexico and its later status as part of the United States. After the territory of New Mexico was admitted to the Union in 1912, a commission examining the new state's symbols recommended that both the "American" and "Mexican" eagles be American golden eagles, but instead it uses an American bald eagle for the United States and a harpy eagle for Mexico. The Aztecs, who probably adopted the custom from the Toltecs, used flags to organize and coordinate their warriors in battle. The flags or pantli were made out of different colored feathers and displayed the personal coat of arms of the officer carrying them. During the battle the flags were carried on the back to allow mobility and to display prominently the prestige of the warrior. Bernal Díaz del Castillo states that Hernán Cortés defeated the Aztecs in Otumba by knocking the flag off of the Aztec general. The Aztec warriors thought that the general was taken prisoner and thus fled the battleground. Aztec rivals, especially the kingdoms of Tlaxcala and Michoacán, had their own coat of arms. For a few months, after the deposition of Cuauhtémoc, the last Aztec emperor, Cortés governed Mexico as virtual sovereign. Therefore, it could be said that his coat of arms was the official one in Mexico. His personal insignia bore the image of the Virgin Mary. It is known that he carried his insignia throughout the conquest of Mexico. From 1521 to 1821, the coat of arms of New Spain, as Mexico was known, was the Cross of Saint Andrew. It was always displayed alongside the coat of arms of Spain. In 1581, Father Durán drew his version of the foundation of Mexico on his book about Mexico; the snake was included for the first time. It would become a common icon, but it would still not be used as a coat of arms. In 1810, Father Miguel Hidalgo, leader of the first stage of the Independence war, used the Virgin of Guadalupe as a flag or estandarte. It was seized from the parish of Atotonilco. The flag is displayed in the National Museum of History alongside, and with the same rank as, later Mexican flags. In that sense, this religious image could be officially regarded as the first Mexican coat of arms. In 1812, the second stage of the Independence war, José María Morelos y Pavón used a crowned eagle standing atop of three arches and a cactus. In small print inside the arches was the acronym "VVM", which stands for "Viva la Virgen María" (or, Long Live the Virgin Mary). In large print and surrounding the eagle, there are golden letters with the legend "OCVLIS ET VNGVIBUS AEQVE VICTRIX", meaning "BY HER EYES AND GRIP EQUALLY VICTORIOUS". In 1821, Agustín de Iturbide, the first Emperor of Mexico, introduced a royal crown on the eagle as a symbol of his empire. The elements were drawn in a European style; the eagle was drawn in front view. In 1823, with a design by José Mariano Torreblanca, the crown was removed, and new elements from European tradition were introduced to celebrate the victory of the Republic. The coat of arms was now official and began to be used in coins, stamps, seals and official papers. Many variants of this design can be found as it would not be defined by law until 1917. In 1863, Maximilian I of Mexico, the second emperor of Mexico, reintroduced the royal crown, and the coat of arms was surrounded by the imperial mantle with the motto Religión, Independencia ("Religion, Independence"). In 1865, a second version was made for Maximilian, in which the royal crown disappeared and two glyphs were introduced with the motto Equidad en la Justicia ("Equity in Justice"). In 1867, after the fall of the Second Mexican Empire, the Republic restored most of the elements of the 1823 version. In 1887, President Porfirio Díaz made changes to the eagle so that its overall appearance reflected the French style. 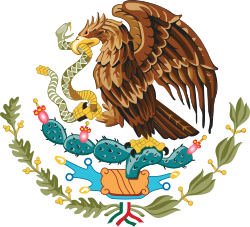 In 1916, President Venustiano Carranza reversed the changes made by Díaz, and restored some of the original Aztec symbols: the water snake was replaced with a rattlesnake, and the eagle was now seen in a side view instead of a front view. This design was created by the artists Antonio Gómez and Jorge Enciso. However, due to the political problems of the time, it was not made official until 1932, under President Abelardo L. Rodríguez. In 1968, President Gustavo Díaz Ordaz ordered a small change, so the eagle would look more aggressive. This design, by the painter Francisco Eppens Helguera, is still used today. Also, a law was made to define and control the use of the national symbols. 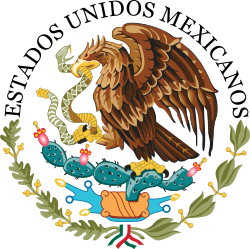 In the official documents of the Mexican government secretariates during Vicente Fox's presidency (2000–2006), the images of the head of the eagle and the snake appear coming up from a stripe. The detractors of the Fox administration called this image El Águila Mocha – literally "the slashed eagle" but colloquially also "the prudish eagle", referring to Fox's government links with the religious right (mocho can mean both "mutilated" and "reactionary"). In 2006, President Felipe Calderón adopted the complete coat of arms for official documents and rejected the "slashed eagle". ^ a b Minahan, James B. (2009). The Complete Guide to National Symbols and Emblems. ABC-CLIO. p. 718. ISBN 9780313344978. ^ González Block, Miguel A. (2004). "El Iztaccuhtli y el Águila Mexicana: ¿Cuauhti o Águila Real?". Arqueología Mexicana. Archived from the original on 2009-02-16. Retrieved 2009-01-18. (Iztaccuhtli should be iztaccuahtli and cuauhti should be cuauhtli.) This page shows the beginning of an article in Arqueología Mexicana XII: 70, pp. 60–65 (2004). ^ Padilla, Carmella (Spring 2012). "The Great Seal of the State of New Mexico" (PDF). El Palacio Magazine: 88–89. Wikimedia Commons has media related to Coats of arms of Mexico. Aztec mythology is the body or collection of myths of Aztec civilization of Central Mexico. The Aztecs were Nahuatl-speaking groups living in central Mexico and much of their mythology is similar to that of other Mesoamerican cultures. According to legend, the various groups who were to become the Aztecs arrived from the north into the Anahuac valley around Lake Texcoco. The location of this valley and lake of destination is clear – it is the heart of modern Mexico City – but little can be known with certainty about the origin of the Aztec. There are different accounts of their origin. In the myth the ancestors of the Mexica/Aztec came from a place in the north called Aztlan, the last of seven nahuatlacas to make the journey southward, hence their name "Azteca." Other accounts cite their origin in Chicomoztoc, "the place of the seven caves," or at Tamoanchan. 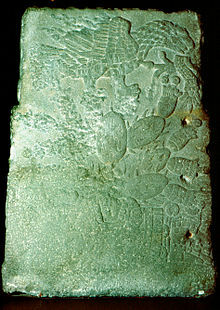 The Aztecs were a Mesoamerican culture that flourished in central Mexico in the post-classic period from 1300 to 1521. The Aztec peoples included different ethnic groups of central Mexico, particularly those groups who spoke the Nahuatl language and who dominated large parts of Mesoamerica from the 14th to the 16th centuries. Aztec culture was organized into city-states (altepetl), some of which joined to form alliances, political confederations, or empires. The Aztec empire was a confederation of three city-states established in 1427, Tenochtitlan, city-state of the Mexica or Tenochca; Texcoco; and Tlacopan, previously part of the Tepanec empire, whose dominant power was Azcapotzalco. Although the term Aztecs is often narrowly restricted to the Mexica of Tenochtitlan, it is also broadly used to refer to Nahua polities or peoples of central Mexico in the prehispanic era, as well as the Spanish colonial era (1521–1821). The definitions of Aztec and Aztecs have long been the topic of scholarly discussion, ever since German scientist Alexander von Humboldt established its common usage in the early nineteenth century. In Aztec mythology, Xolotl was the god with associations to both lightning and death. He was associated with the sunset and would guard the Sun as it traveled through the underworld every night. Dogs were associated with Xolotl. This deity and a dog were believed to lead the soul on its journey to the underworld. He was commonly depicted as a monstrous dog. Xolotl was the god of fire and lightning. He was also god of twins, monsters, misfortune, sickness, and deformities. Xolotl is the canine brother and twin of Quetzalcoatl, the pair being sons of the virgin Coatlicue. He is the dark personification of Venus, the evening star, and was associated with heavenly fire. In Aztec religion, Coyolxāuhqui is a daughter of the priestess Cōātlīcue. She was the leader of her brothers, the Centzon Huitznahuas. She led her brothers in an attack against their mother, Cōātlīcue, when they learned she was pregnant, convinced she dishonored them all. The attack is thwarted by Coyolxāuhqui's other brother, Huitzilopochtli, the national deity of the Mexicas. Tlaltecuhtli is a pre-Columbian Mesoamerican deity worshipped primarily by the Mexica (Aztec) people. Sometimes referred to as the "earth monster," Tlaltecuhtli's dismembered body was the basis for the world in the Aztec creation story of the fifth and final cosmos. In carvings, Tlaltecuhtli is often depicted as an anthropomorphic being with splayed arms and legs. Considered the source of all living things, she had to be kept sated by human sacrifices which would ensure the continued order of the world. Ophiophagy is a specialized form of feeding or alimentary behavior of animals which hunt and eat snakes. There are ophiophagous mammals, birds, lizards, and even other snakes, such as the Central and South American mussuranas and the North American common kingsnake. The genus of the venomous king cobra is named for this habit. The Templo Mayor was the main temple of the Mexica peoples in their capital city of Tenochtitlan, which is now Mexico City. Its architectural style belongs to the late Postclassic period of Mesoamerica. The temple was called the Huēyi Teōcalli [we:ˈi teoːˈkali] in the Nahuatl language. It was dedicated simultaneously to Huitzilopochtli, god of war, and Tlaloc, god of rain and agriculture, each of which had a shrine at the top of the pyramid with separate staircases. The spire in the center of the adjacent image was devoted to Quetzalcoatl in his form as the wind god, Ehecatl. The Great Temple devoted to Huitzilopochtli and Tlaloc, measuring approximately 100 by 80 m at its base, dominated the Sacred Precinct. Construction of the first temple began sometime after 1325, and it was rebuilt six times. The temple was destroyed by the Spanish in 1521 to make way for the new cathedral. The Aztec religion is the Mesoamerican religion of the Aztecs. Like other Mesoamerican religions, it had elements of human sacrifice in connection with a large number of religious festivals which were held according to patterns of the Aztec calendar. Polytheistic in its theology, the religion recognized a large and ever increasing pantheon of gods and goddesses; the Aztecs would often incorporate deities whose cults came from other geographic regions or peoples into their own religious practice. Aztec cosmology divides the world into thirteen heavens and nine earthly layers or netherworlds, each level associated with a specific set of deities and astronomical objects. The most important celestial entities in Aztec religion were the Sun, the Moon, and the planet Venus —all of these bearing different symbolic and religious meanings as well as associations with certain deities and geographical places—whose worship was rooted in a significant reverence for the Sun and Moon. One name for the Aztecs is "Warriors of the Sun." The Mexica (Nahuatl: Mēxihcah, Nahuatl pronunciation: [meːˈʃiʔkaʔ] or Mexicas were a Nahuatl-speaking indigenous people of the Valley of Mexico, known today as the rulers of the Aztec Empire. This group was also known as the Culhua-Mexica in recognition of its kinship alliance with the neighboring Culhua, descendants of the revered Toltecs, who occupied the Toltec capital of Tula from the tenth through twelfth centuries. The Mexica were additionally referred to as the "Tenochca", a term associated with the name of their altepetl, Tenochtitlan, and Tenochtitlan's founding leader, Tenoch. The Mexica established Mexico Tenochtitlan, a settlement on an island in Lake Texcoco. A dissident group in Mexico-Tenochtitlan separated and founded the settlement of Mexico-Tlatelolco with its own dynastic lineage. The name Aztec was coined by Alexander von Humboldt who combined "Aztlan", their mythic homeland, and "tec ", 'people of'. The term Aztec is often used very broadly to refer not only to the Mexica, but also to the Nahuatl-speaking peoples or Nahuas of the Valley of Mexico and neighboring valleys. The Teocalli of the Sacred War is the name given by archaeologist Alfonso Caso to a monolithic pre-Columbian miniature of an Aztec temple, thought by some to have served as a throne for Motecuhzoma II. In Aztec mythology, the Creator-Gods are the only four sons of the creator couple Ometecuhtli and Omecihuatl "Lord and Lady of Duality", "Lord and Lady of the Near and the Close", "Father and Mother of the Gods", "Father and Mother of us all", who received the gift of the creation to create other living beings without childbearing, they are residing atop a mythical thirteenth heaven Ilhuicatl-Omeyocan "the place of duality". In the Aztec culture, a tecpatl was a flint or obsidian knife with a lanceolate figure and double-edged blade, with elongated ends. Both ends could be rounded or pointed, but other designs were made with a blade attached to a handle. It can be represented with the top half red, reminiscent of the color of blood, in representations of human sacrifice and the rest white, indicating the color of the flint blade.